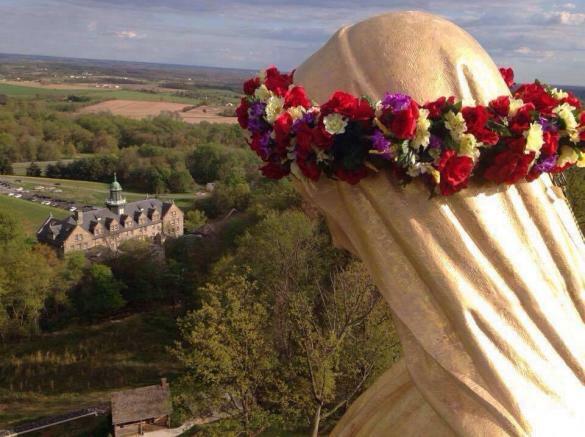 A beautiful ceremony accompanies the traditional Crowning of Mary in May - a month dedicated to her - let's honor her with both our prayerful thanks and petitions for her powerful intercession. A 12 ft. long silk flower crown will be hoisted over 100 ft. in the air to crown our 25 ft. tall gold-leafed bronze statue of our Blessed Mother. Between the May Crowning, May 6, and Mother's Day, May 14, the National Shrine Grotto will place a rose for each donation made online at the altar of the Grotto's Chapel. Procession and Crowning, 1 p.m.